The leaves are evergreen and aromatic, it has delicate blue flowers and is a useful culinary, medicinal and cosmetic plant. It's equally at home in the shrub border or herb garden. Here’s how to care for a new plant. 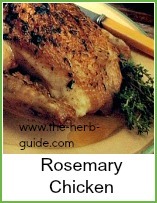 You will probably have bought your rosemary plant in a pot. When you select your plant, make sure it is healthy and there is good growth. Watch out for it being 'pot bound' which is indicated by roots growing out of the holes at the bottom of the plant. 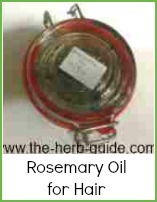 This might result in poor growth and roots getting broken when you take it out of the pot. Dig a hole just a bit bigger than the plant pot. To check it's the right size, dig the hole, then put the plant pot in to make sure you've moved enough soil. Take the plant out of the pot and separate the roots. Take care when you do this – just knead the root ball in your hands and pull out the roots very gently – this way the roots get a good start into the surrounding soil. If you fail to do this, you might find that the roots will be too impacted to push out from the root ball - I'm sure you've had plants that fail and when you remove them, the root ball is still pretty much how it was when you planted it. Fill the hole in the ground that you’ve made with water – the term is ‘puddle it’. Put the rosemary plant in , spread the roots out and then cover with the soil you have removed. Firm down - that means push the soil down around the planting hole with your shoe or hands - take care here to firm down well - don't allow the roots to sit in an air pocket – keep pushing down until it’s firm – leave a small dip around the plant for watering. Keep it well watered for its first season also keep it free of weeds. You can use it during the first year - cut the sprigs as you need them keeping an eye on the shape – each time, take the sprigs from a different part so as not to make the bush lopsided. It can grow quite large and needs cutting back to keep it in a neat, bushy shape. 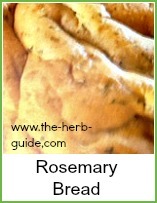 Overwintering can be a problem in colder areas as it is a Mediterranean herb and so is inclined to be tender. You can get round this by covering with horticultural fleece in the winter or take cuttings in late summer to protect against loss of the plant. Take four inch sprigs and strip the leaves off the lower half - dip into hormone rooting powder and then put into compost. Leave alone for a few months and you will have fine new plants. 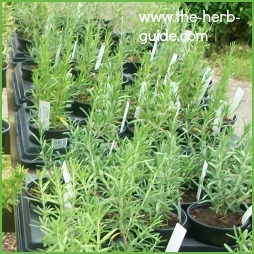 You can either give the surplus away or sell them - see the page growing herbs for profit for more details. 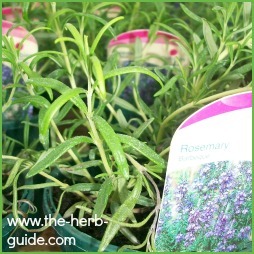 Rosemary does best in a lime soil, so if your soil is not suitable, then a few crushed eggs shells, some garden lime or powdered chalk should be worked into the soil around the planting hole. Choose whichever lime addition is easiest for you. Add some more in subsequent years if the leaves begin to go yellow.